You are here: Home / Single Mom Life / Want to Change Your Life? Become CEO of Your Home. Want to Change Your Life? Become CEO of Your Home. This interview is a part of a series, Life Lessons You Want to Know from Successful Single Moms. This post contains affiliate links, which means that if you buy a suggested product I will earn a small commission. Read the full disclosure policy here. 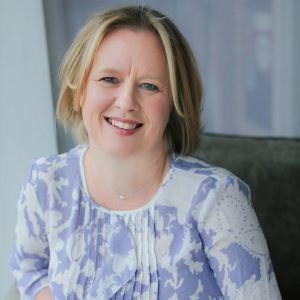 During Sarah’s more than 20 years in a corporate career, she has held a variety of roles in technology and business operations, project management, and strategic planning. All of her positions have involved sorting out disarray and putting routines and information hubs in place to get things done faster and easier with less under-the-breath muttering from everyone. Now, Sarah helps women take control and become CEOs of their own lives. What was one of the most difficult times in your life as a single mom? What made that time challenging? The most difficult time was making the break because I was single and living in a foreign country. I suddenly had to navigate health insurance and taxes and other things I had never had to do before–things that seemed to confuse people who were born and raised here! I believe that every challenge gives us an opportunity to learn and grow. What important life lessons did you learn from that time in your life? My biggest lesson was that I was capable of a lot more than anyone thought, including me. What did you do to overcome those challenges? I did what we all do; I sat down, cried, drank wine, and then marched on. There was no other option. I had to get on with it so my daughter and I could survive. How are you financially supporting your family and how does that fulfill your mission or calling in life? I worked in technology project management for twenty years because I’m good at it and it paid the bills. Now, my own business helps overwhelmed moms take control so they can live, not just survive and pay the bills. I want to tell every mom, especially single moms: Stop treating yourself like an unpaid intern. 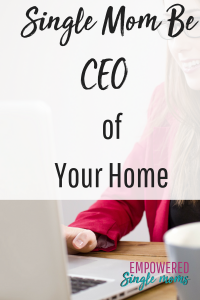 Become CEO of your home! Have you changed what you do for work or how you do your work since becoming a single mom? I didn’t change what I was doing, but I put more effort into it to increase my salary and flexibility of schedule and location. I fought for the ability to work from home so I could work through sick days. What advice do you have for women who are in the beginning stages of separation and divorce? From a practical standpoint, I would say don’t worry about “the stuff” so much. Figure out the minimum you need to keep life running: somewhere to sleep, somewhere to sit and eat, and things to cook and clean with. I left with my daughter, her toys, two twin beds, a patio table and chairs, minimal kitchen equipment, clothes, and books. Our first months were like a long-term camping adventure! But I was able to move everything quickly and easily. Plus, I was able to go buy new things that had no connection to our old life. That made a cleaner break for us. From an emotional standpoint, take any help you can get and realize that things will get better because you have the ability to make them better. Also, stop and figure out why things went south in your marriage and own your part in it. I see so many women bouncing from one relationship to another identical relationship without stopping to figure out why they make the choices they do and how to make better choices to get the life they want and not more of what they didn’t like. What are you reading or what would you recommend? I recently read Tiffany Dufu’s Drop the Ball. It’s about how we moms don’t have to do all the things; we need to get the rest of the family involved. My challenge in implementing her plan is that I don’t have a partner to hand off half the duties to. A lot of people don’t realize single moms often have to pay for the help married moms get from their spouses. You can learn more about Sarah’s work on her Facebook page. This page contains all the information you need to promote yourself through the ranks to become CEO of your whole life the easiest way possible: by getting things off your to-do list! Previous Post: « Are Your Kids Prepared to Make This School Year Fantastic?